This Light Award is sponsored by Free Mind Power Books and processed through Kiva.org. Rehmat lives in Okara, a small city in Pakistan known for its agriculture industry. She and her family have lived in the area of Faisal Park for the past 16 years in a 2-room brick house. Rehmat is 41 years old and married to Asghar Ali, who has a date-selling business. He leaves his home early in the morning after putting dates on his cart. He visits different streets and markets in the city and sells the dates. Rehmat helps him by arranging dates on the cart for him each day. 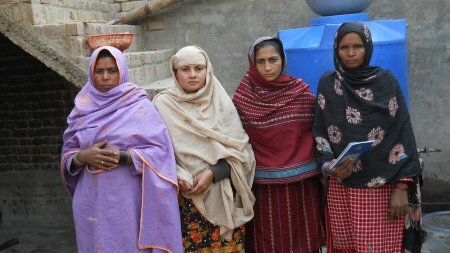 Rehmat is a housewife who stays at home and performs her household responsibilities. She has 3 sons and 3 daughters. Her eldest son works for a private organization, her second son sells a breakfast food called nan chanay (chickpeas served with bread) from a cart and her eldest daughter sews for clients in the community. Rehmat has only been able to provide an education for one child, who is 7 years old. She has applied for a loan from Kiva partner Asasah to help her husband in his business. With the loan, he will replace his current cart, which has become rough and rotten in different places. Her husband has been in this business for 16 years and Rehmat is hopeful that investing in the business will bring positive financial changes to her family life. She is a regular loan user of Asasah and this is her fifth loan application. During previous loans, she has maintained good credit and has never missed a meeting. Congratulations to Rhemat and group.